Putting on his old costumes was like a�?a�?time travel,a��a�� he observes. a�?a�?We tried some new things in the wardrobe fittings but I kept saying, a�?nope, nope, nope.a�� Ultimately, I just wore the same thing. It felt right,a�? he continues.Carreya��s chemistry with his co-star Jeff Daniels is a riot. Can we see the same chemistry a second time around? a�?The first one was a discovery. Youa��re meeting a new friend. Youa��re kind of shy about it. And then now, it was like family. We were coming off the bus together, and we saw the playback and it was like, a�?Ah! Theya��re back, man.a�� It just kind of gave us a good feeling. It was like old friends,a�? he says. It was Carreya��s idea to come up with a sequel. a�?As you get older, you value these things. Ita��s like I want to be with the gang again. I want to hang out with Jeff Daniels. I want to hang out with the Farrellys. Ita��s about a�?leta��s go have some fun.a�� Leta��s go do something dumb,a�? says the 52-year-old. About another sequel he would like to work on, Carrey says, a�?Lemony Snicketa��s sequel because it was just an opportunity to do a lot of whacked out characters and stuff like that, but I dona��t have hard and fast rules creatively. 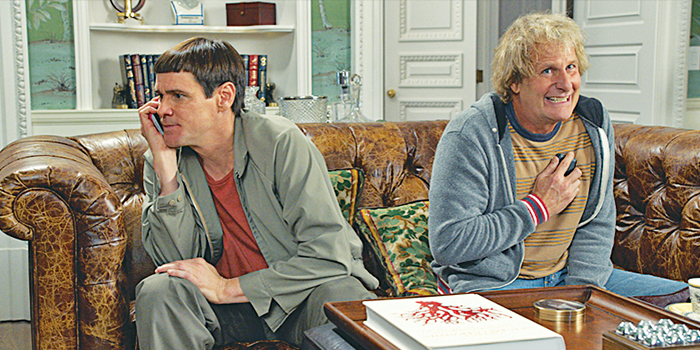 If it sounds fun in the moment, Ia��ll go there.a�?Dumb and Dumber To is scheduled to release today.